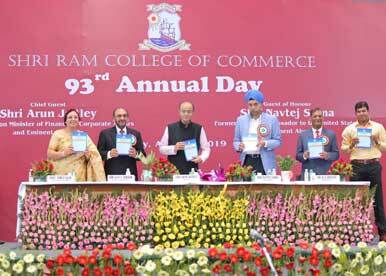 New Delhi: Shri Ram College of Commerce held its ninety-third Annual Day on April 6, 2019, at the College Sports Complex. The Chief Guest Mr. Arun Jaitley, Union Finance Minister and alumnus as also the Guest of Honour Mr. Navtej Singh Sarna, an alumnus and former Indian Ambassador to the United States of America were received by the Chairman, Mr. Ajay S. Shriram and the Principal Prof. Simrit Kaur. Prof. Simrit Kaur presented the College Annual Report 2018-19 highlighting achievements as also the events and activities of the college. The Principal reiterated the college’s resolve to maintain its pre-eminence in academics, research, consultancy and social responsibilities. The students of the college have worked very hard and continue to have the top ranks in the university in academics. They have done exceedingly well in extra-curricular activities and sports. In the past year the college has organized international conferences and workshops for students and faculty. SRCC has also signed MoUs to collaborate actively with other institutions like RBI Academy, ICLS Academy, Ministry of Corporate Affairs, Government College for Women, Jammu, as also with three institutions abroad: Melbourne Business School, Australia; Thammasat University, Bangkok, Thailand and Gedu College of Business Studies, Gedu, Bhutan. Mr Arun Jaitley was the star speaker at the event. He emphasized the role of the college as a quality institution that has shaped many a business leader. Referring to his student days, Mr. Arun Jaitley reminisced how India has changed and how the opportunities and challenges faced by current students are very different from what they had to confront earlier. The college publications like Business Analyst and Yamuna Magazine and others were released. Awards and prizes were given out to outstanding alumni and students by the dignitaries in appreciation of the meritorious work done by them.